Ew, not very nice looking at this point! Every now and then I try my hand at screen printing. My screens are whatever fabric I had on hand, painted with screen filler, in embroidery hoops. I recently got a set of colored inks (had only used black and red before) and tried them out for the first time today, printing on muslin produce bags. The colors look pretty garish right out of the jar, but I had some fun mixing them together on the screens. I'm happy with how the red and blue mixed and came through onto the fabric. Progression: The colors mixed to a pretty uniform purplish color, and I added a bit more red to the center each time. I used some of the muddy color left from the first ones together with more blue, some yellow and white for the next design. I like how the first print almost has a watercolor-like look. After that the color gets pretty uniform. Yellow, blue, and white to make a good pea-green. 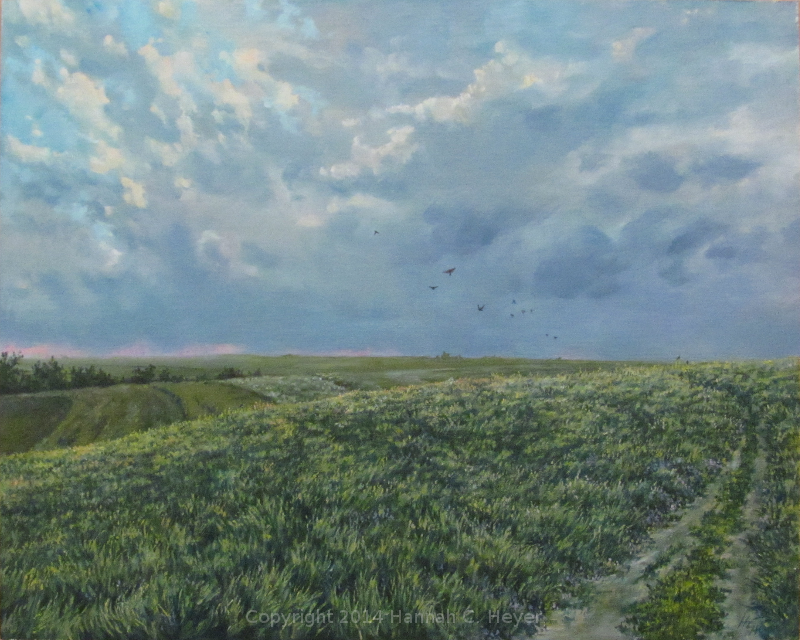 Wind Across the Fields, 16 x 20" oil on linen/birch panel. Love the feeling of the wind blowing across the fields as the weather moves in from the west. A few birds take flight. 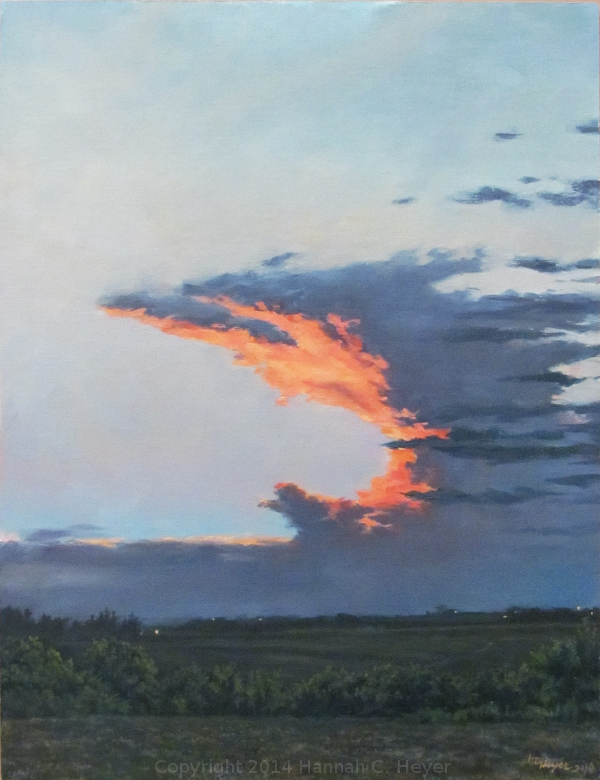 Anvil Cloud at Sunset, 18 x 14" oil on linen/hardboard panel. Crazy skies again. I saw a cloud like this one night and did some quick sketching. The sun has just disappeared, but still illuminates this towering cloud, and the lights of farms across the valley begin to show. These two paintings are hanging out at the local library for awhile. 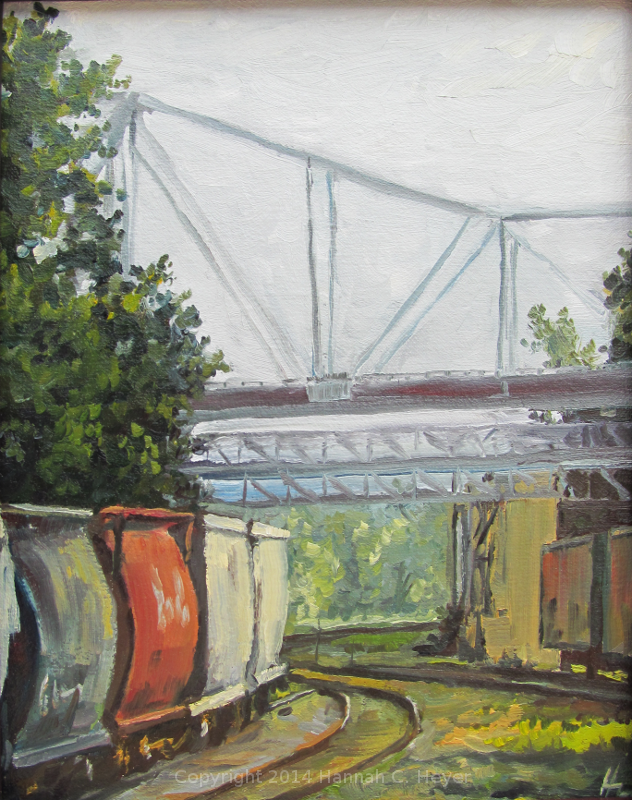 It's been a cold and snowy month, and my painting has mostly been indoors. 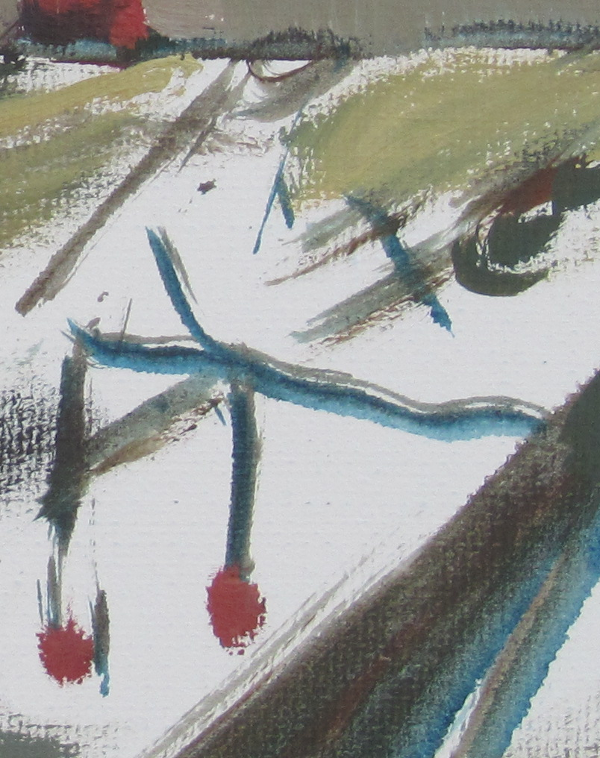 But I have a lot to work on- a bunch of new pieces started, and a sketchbook full of potential ones. Smallest Fattest sleeping in the shadow of my easel. Smallest Fattest Niece (and her mother) accompanied me painting today. Smallest Fattest slept while I set up my easel and got started, and awoke delighted to find herself in a hay field and got right to work. 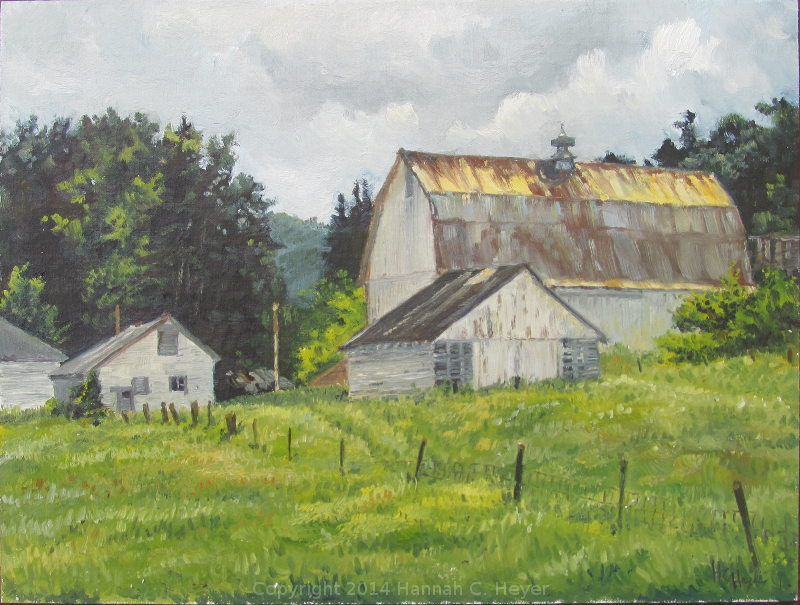 After all, Auntie Hannah's painting gear wasn't going to strew itself about the field, now was it? Someone had to take it in hand! 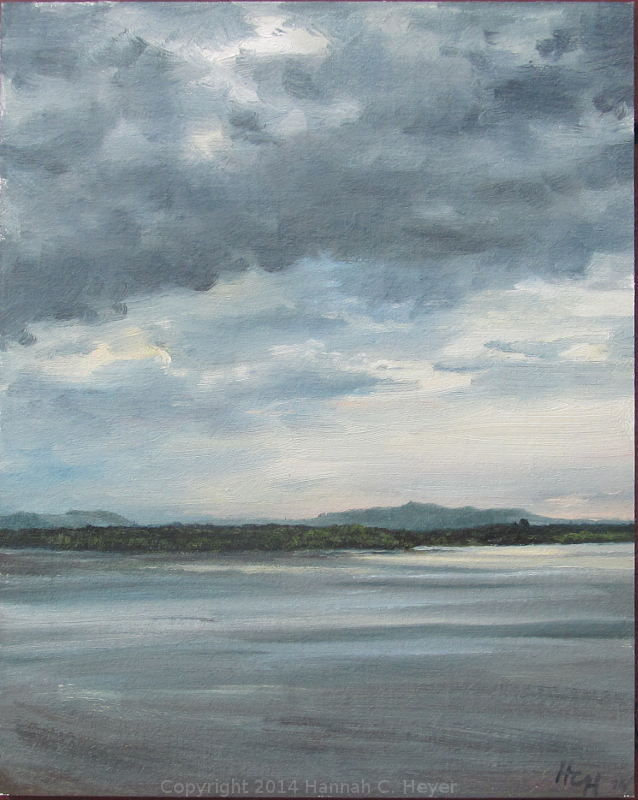 My eyes are always drawn to beautiful skies, dramatic clouds and fleeting light effects. Painting them seems to be a practice in frustration, but I keep trying. Sometimes, on my way home, I drive up this road just because I like the views. This is one place that has always caught my eye, and it was fun having the chance to poke around a bit and see the place from different angles. There is a collection of old outbuildings, a beautiful little barn, and this lovely old worn farm house. 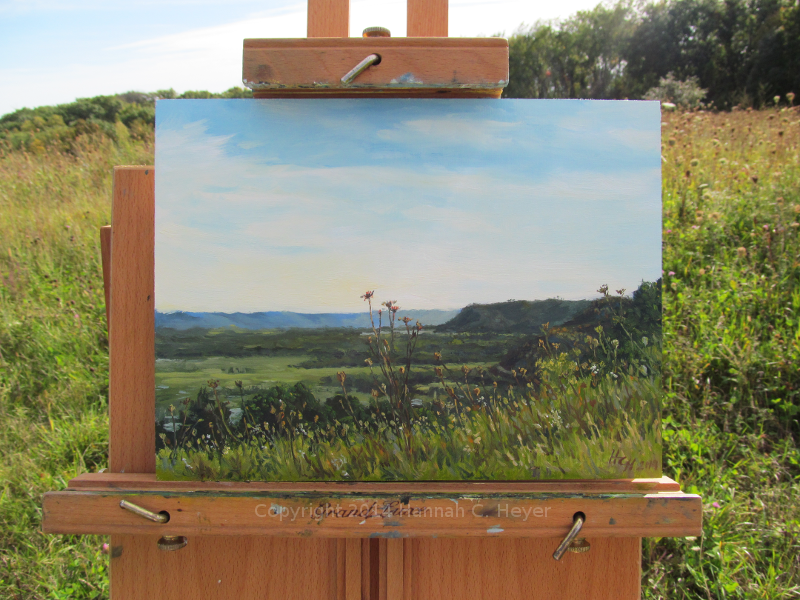 I'd forgotten to put some of my paints back into my plein air gear, which made this a bit more challenging. I was missing my main yellow, and had to squeeze paint from some almost empty tubes to get at the yellow I had, and the blue and white I needed. Oops! 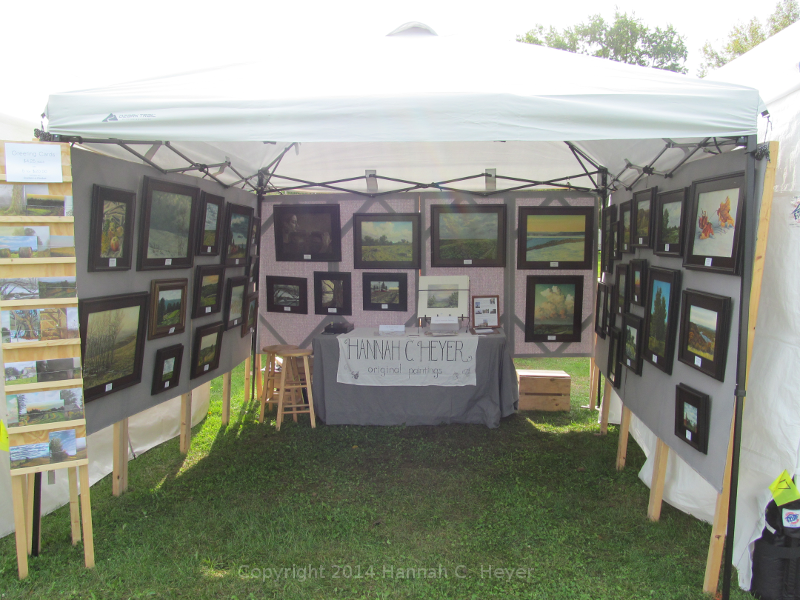 I spent September 20th and 21st in beautiful Soldiers Grove, Wisconsin, at the Driftless Area Art Festival. There are so many talented and skilled artists and artisans in this region, and I was delighted to be included in this event for the first time this year. Thanks to the organizers, who do such a wonderful job, and to everyone who stopped by my booth! It was a great and exhausting weekend. I was also really excited and honored to receive the People's Choice Award! Thank you, everyone! 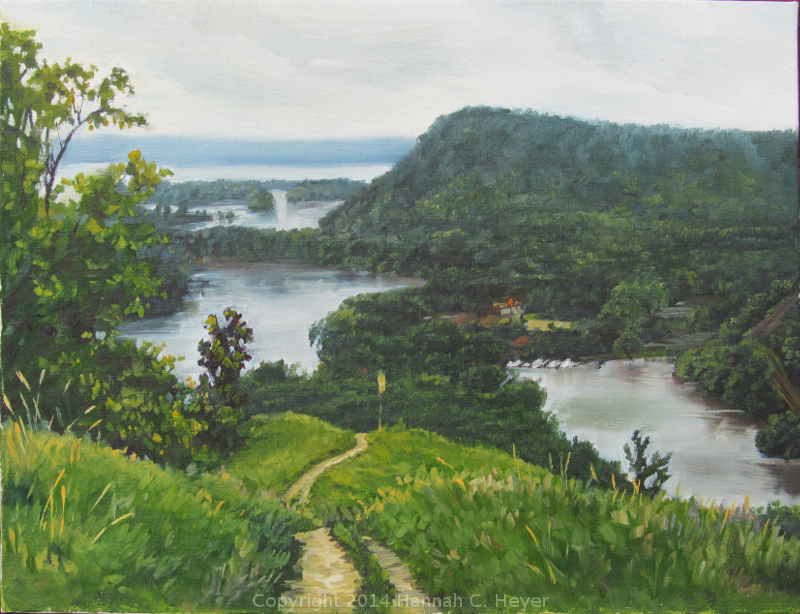 Overlook, above La Crescent, Minnesota. 9 x 12" oil on mounted linen. 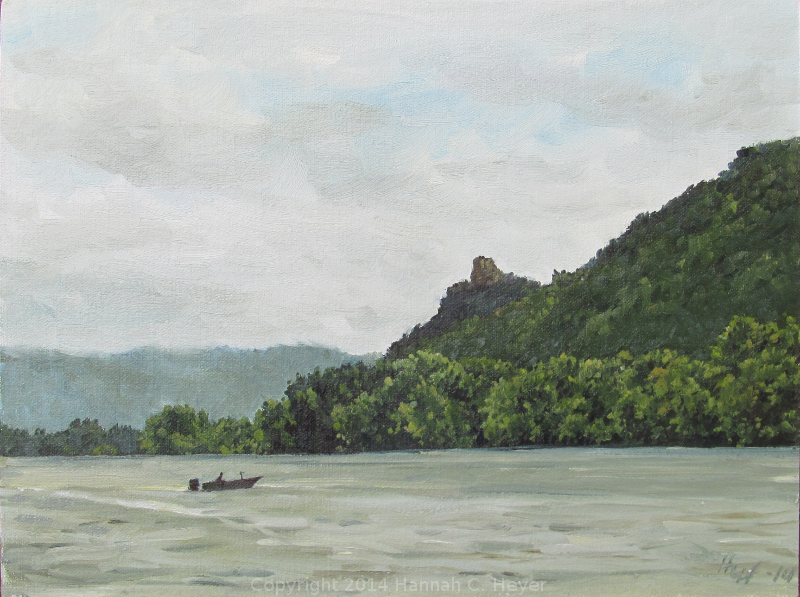 The following week I was able to get some time to paint as part of the Between the Bluffs plein air event in La Crosse, Wisconsin. 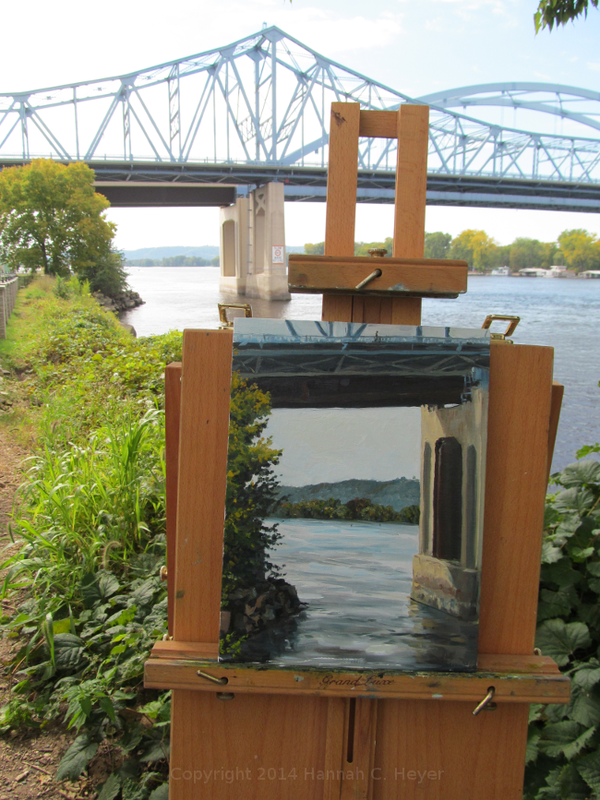 All painting was to be done within ten miles of the downtown area, and I did some painting on the Minnesota side of the river. 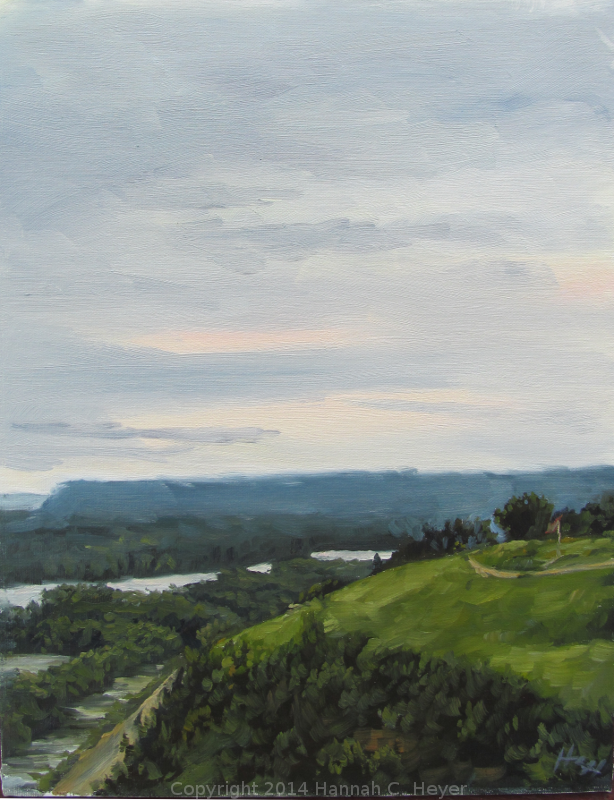 Another painting done above La Crescent, Minnesota. 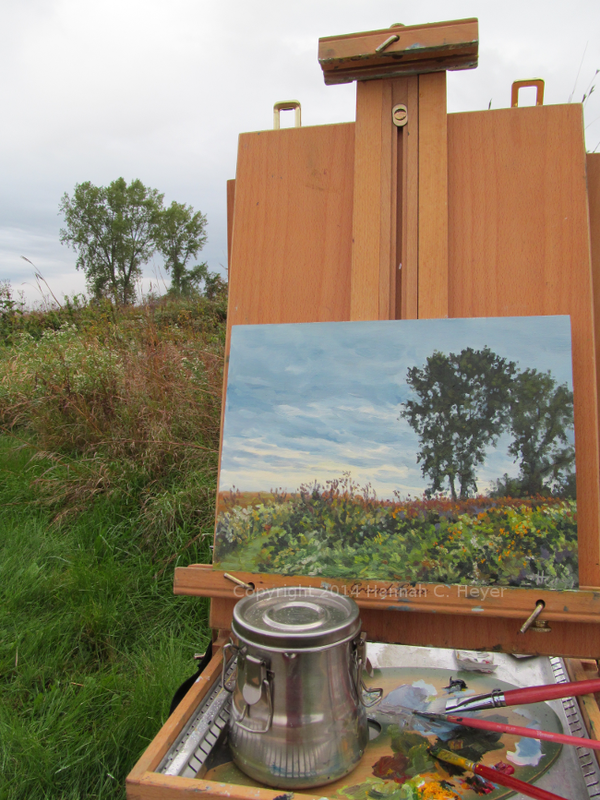 The sky was filled with low clouds, and as I painted I watched the weather move in. A good day to have an umbrella, even if the mosquitoes did congregate underneath it. 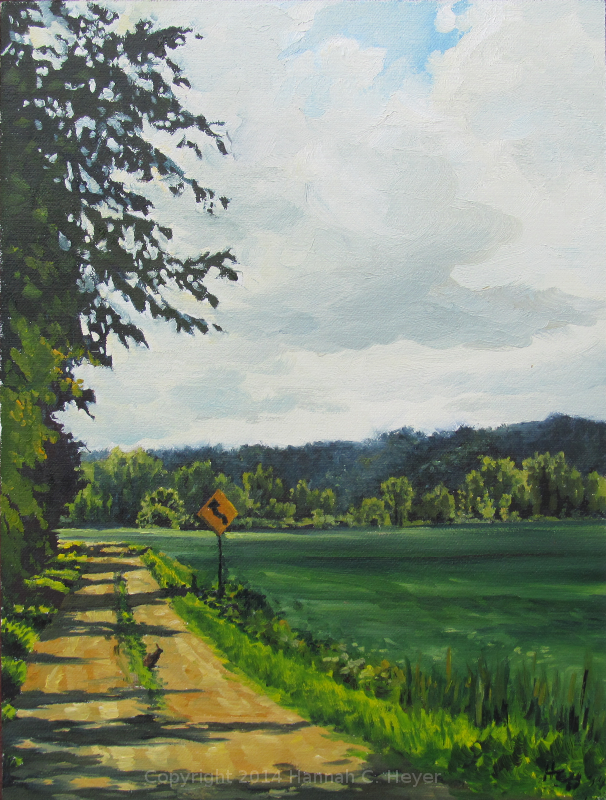 It rained, cleared, and rained again, as I painted autumn grasses and wildflowers, and a couple of trees. 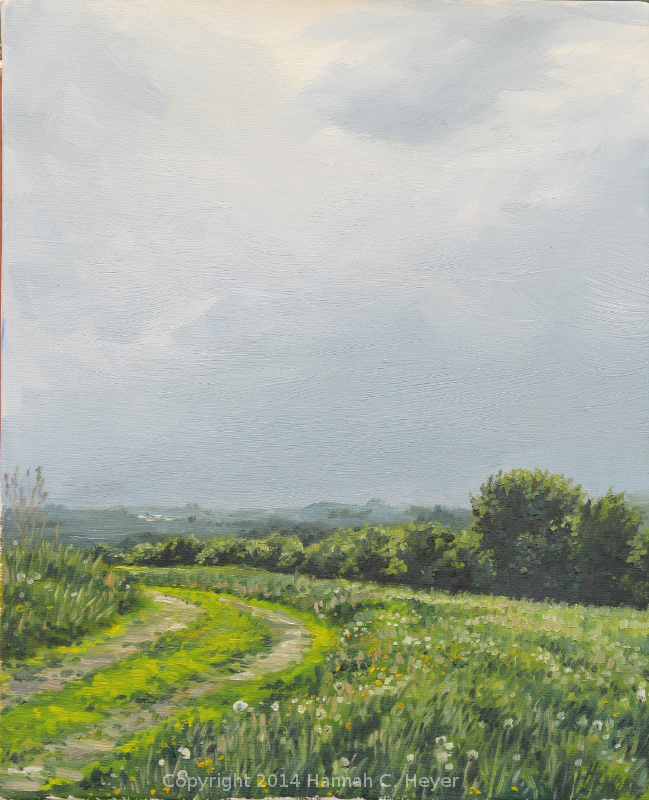 September Showers, 9 x 12" oil on mounted linen. 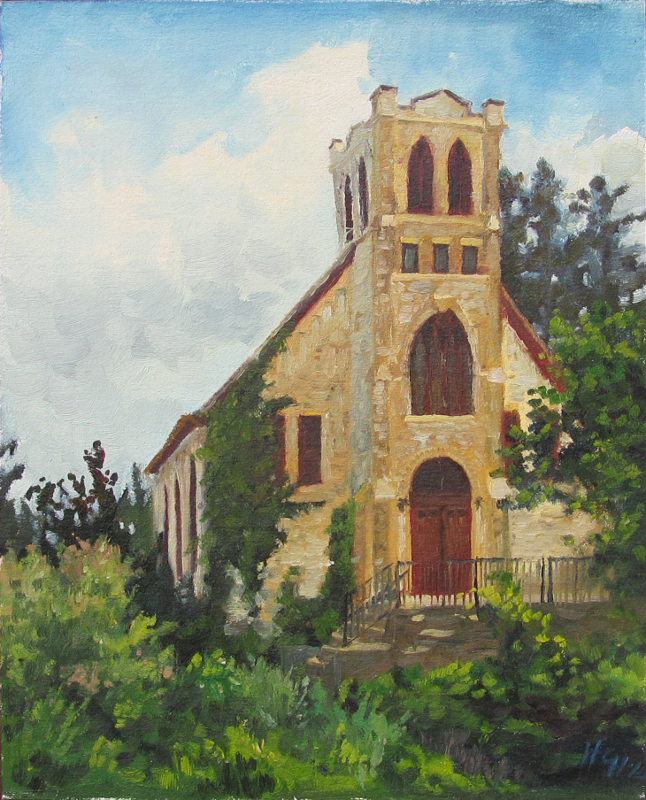 This painting received a merit award at the opening of the show on Saturday! 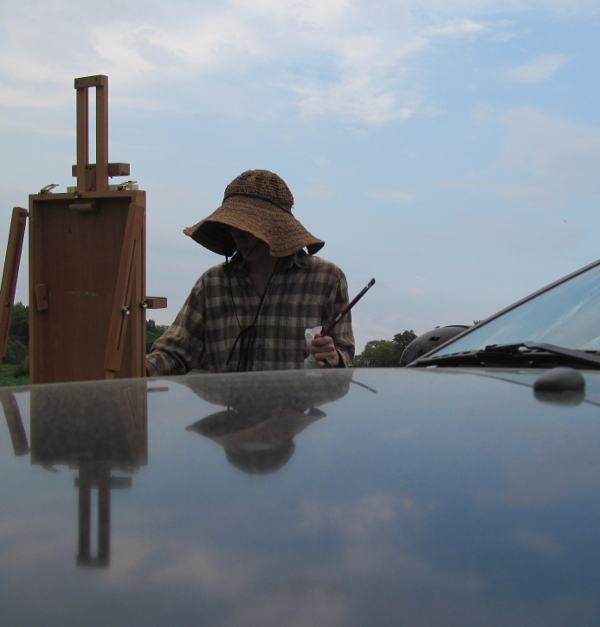 Thursday, September 25th was the quick paint. 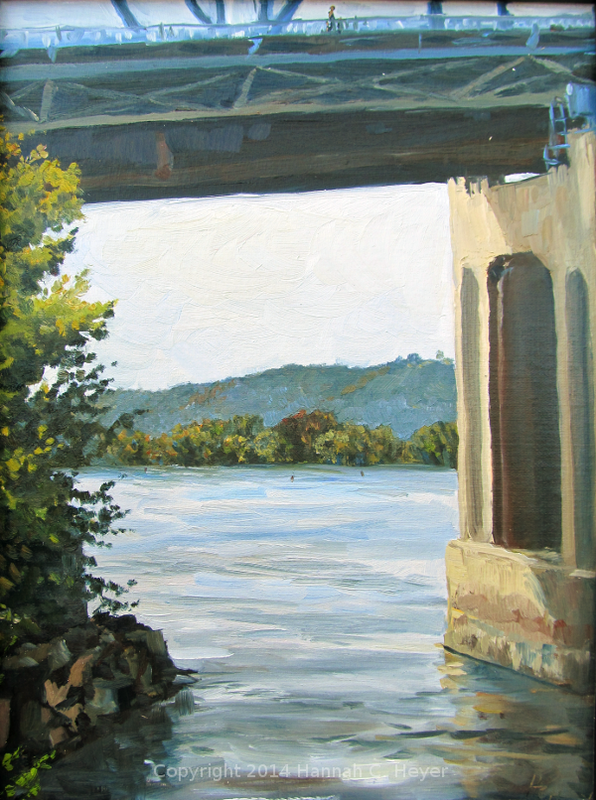 I walked around downtown for awhile, but ended up down in Riverside Park, along with several other artists. I did this little view below the Cass Street bridge. No Wake Zone, 12 x 9" oil on mounted linen. So it's been a pretty exciting few weeks for me! :) I'm so grateful. 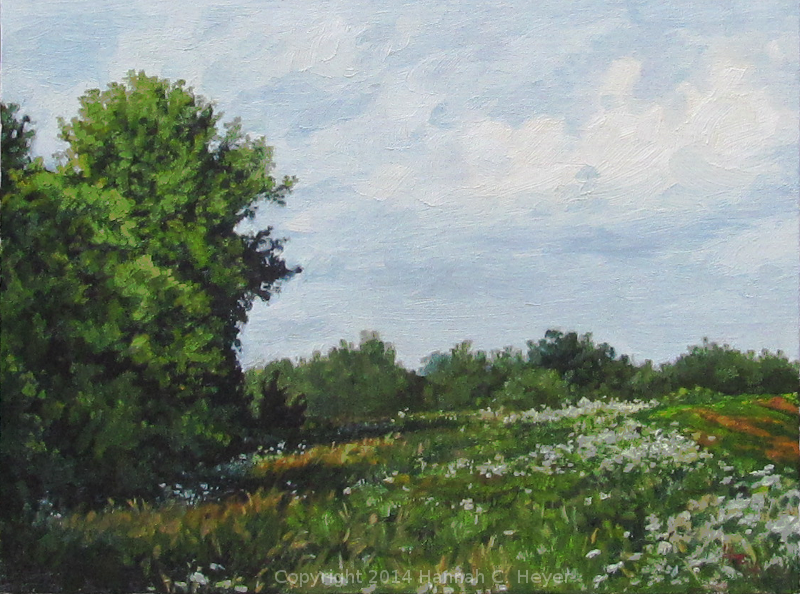 Maple on the Marsh Trail, 10" x 8" plein air oil on stretched linen. Warm and breezy day in La Crosse, Wisconsin. The Myrick Park marsh trails were busy with people enjoying the day, and the water was filled with coots, ducks and noisy geese. 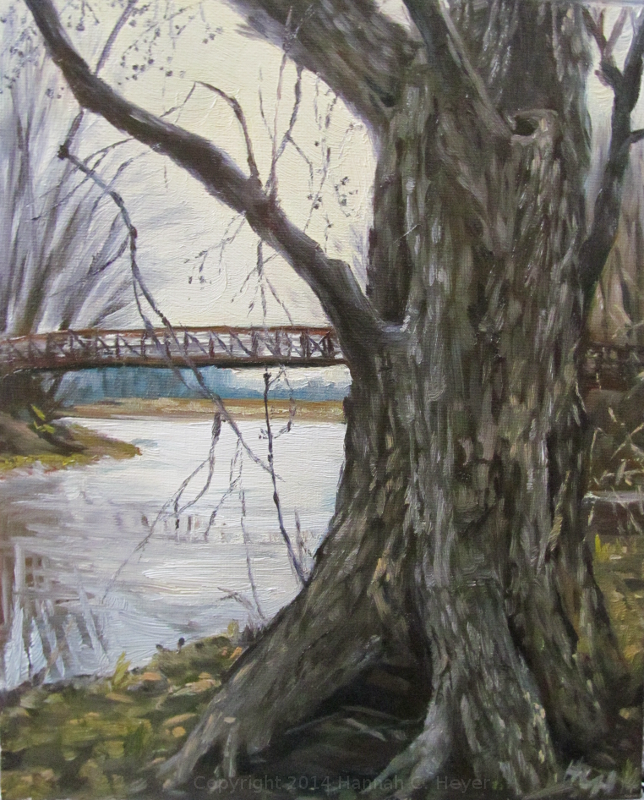 This is a view of the footbridge from just past a large grey maple tree. 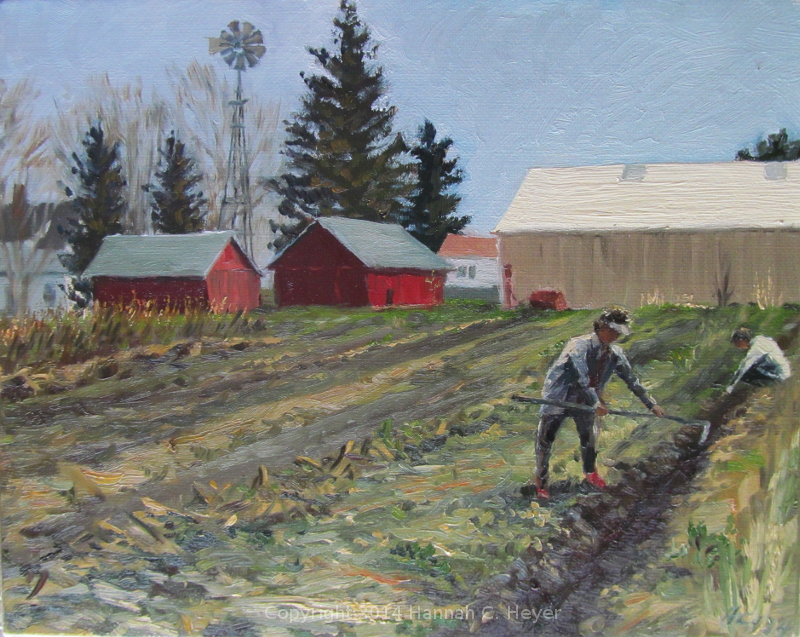 Painting at an old farm in Red Wing, Minnesota. It was pretty windy, and I meant to find a sheltered spot, but ended up out in the open, and just held onto my hat. 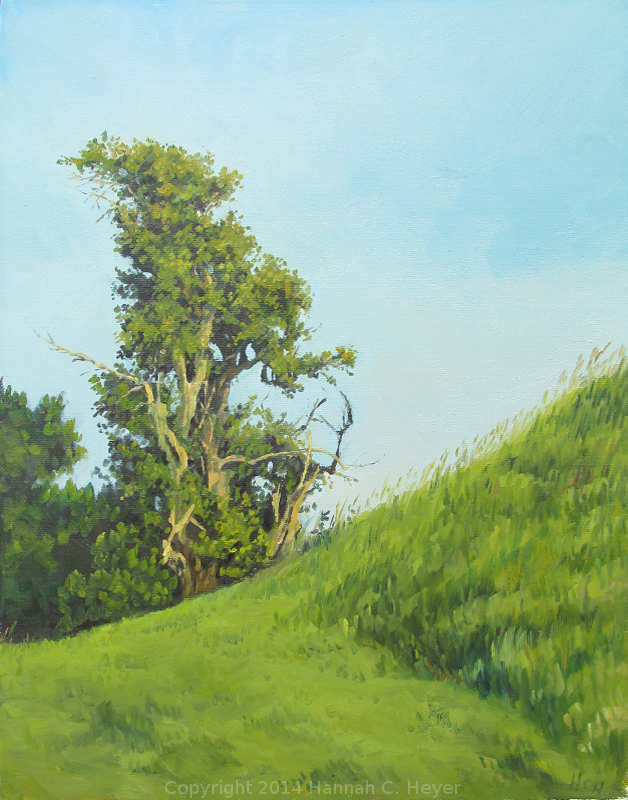 I love these old oak trees, but I got off on the wrong footing trying to paint them. Half way through it looked like my paint tubes had just spewed onto my canvas. It came out okay in the end, if a bit rough, and it was a good challenge anyway! 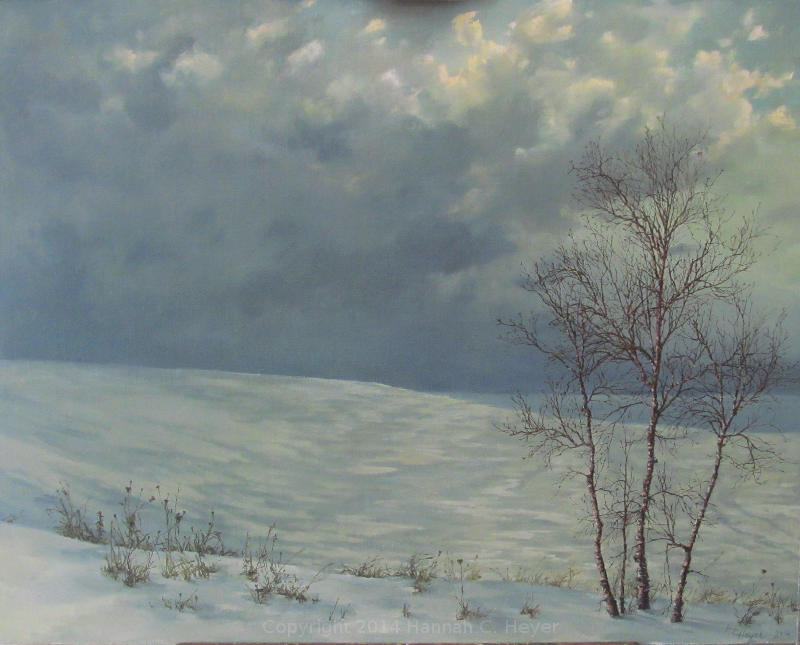 Snow Clouds and Birches, 16 x 20" oil on linen/birch panel. 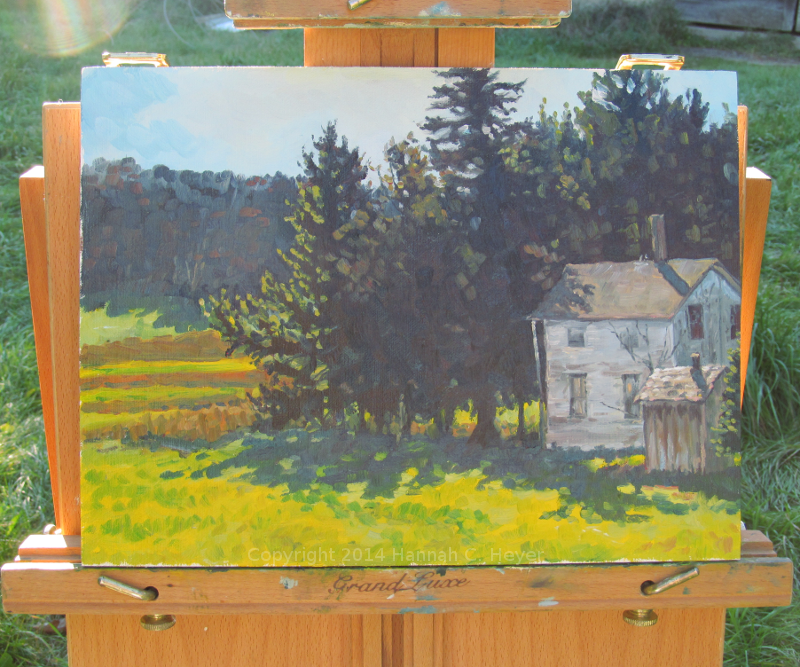 Another one drying on the easel. I find snow so challenging: the way it drifts, catches the light, and casts shadows, and how it can look so different depending on the light, weather, and time of day. It can be dull or dazzling. Hard and soft. I'll keep trying to get it right!